MSPL Holds First Corporate Cricket Tournament | McWane, Inc.
Cricket is an immensely popular sport in India, and is also just as popular with the MSPL team. 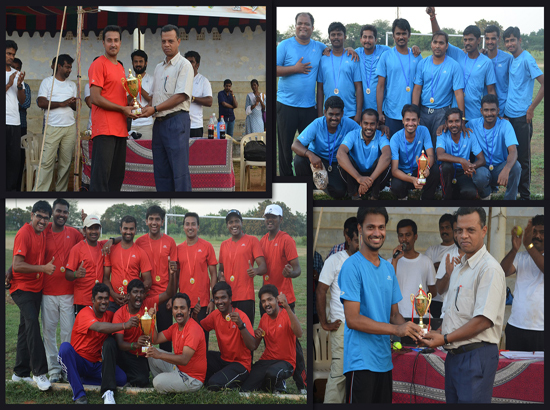 McWane Services Private Ltd had its inaugural edition of the MSPL Cricket World Cup (Soft ball cricket) on Saturday December 13, 2014. The selected venue for this sporting event was the cricket ground at Coimbatore Institute of Technology (CIT). Three teams comprised of team members lined up with team names of SSS (Sales Support and Synapse), Dynamic Dudes (Design and Product Development) and McWinners from the Valve Manufacturing Division (VMD). All team members and their families were invited and there was a great turnout. The tournament was organized into a full day event composed of three league stage matches and a final featuring the top two teams. Safety precautions were taken to ensure that players and spectators were well hydrated with refreshments, and a first aid kit was on standby. A soft ball was also used to ensure that there was no case of physical injury to players. The day progressed with Team SSS and Team Dynamic Dudes edging out the McWinners to enter the finals. In an intense and winner takes all final, Team SSS inched ahead of Team Dynamic Dudes to win the inaugural edition of the MSPL Cricket World Cup. The individual Man of the Match awards was given away by Financial Controller D. Muruganandham and Head of Marketing & Business Development TS Chidambaram. The winner and runner rolling trophies and medals were presented by chief guest Dr Sambath, Physical Education Director of Coimbatore Institute of Technology (CIT). It turned out to be a good outing for the teams. MSPL entered the playing field as opponents, but came out stronger in their friendship and camaraderie. Overall, it was a Saturday well-spent for players and families alike. Posted on December 30, 2014, in Events and tagged CIT, Coimbatore, Coimbatore Institute of Technology, cricket, McWane, McWane Services Private Ltd., MSPL, MSPL Cricket World Cup, tournament. Bookmark the permalink. Comments Off on MSPL Holds First Corporate Cricket Tournament.